I ran out of eyeliner this week so I had to stop by Sephora to pick out a replacement. As you are probably well-aware, going into that store is straight-up dangerous to your wallet. It's way too easy to walk out of there with way more than you came for. But I was determined to buy only a new eyeliner. After wandering around the store testing every eyeliner, from Bare Escentuals to YSL, I manged to make my way up to the register with just one Buxom Lashliner. Go me! That's where they got me with their display of glittery "Jewelry Top Coat" polishes. 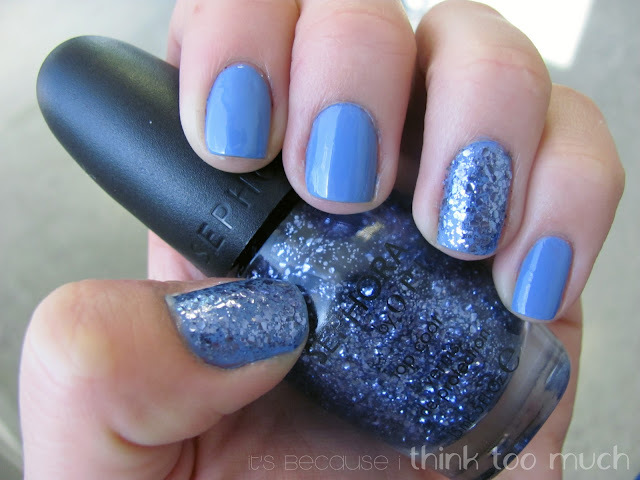 When I saw this bottle of Indi-go With the Flow with it's mix of fine and chunky steel-blue glitter, it absolutely had to be mine--get on my nails! And get on my nails it did! To achieve this look, I swiped three coats of Essie's Lapiz of Luxury on all of my nails. After that was good and dry, I blinged up my thumb and ring finger nails with three coats of Sephora by OPI's Indigo With the Flow. Voila! I'm so thrilled with this mani, it's been on my nail for three days already! What is your most recent beauty impulse purchase? I'd love to know! 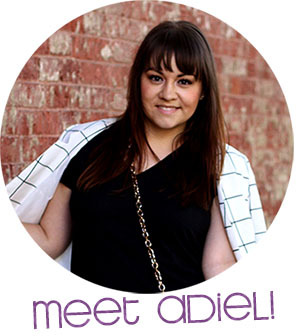 I am OBSESSED with this one, Adiel! Definitely heading to Sephora to buy that polish! Can't wait to see it on your nails! I really love this one girl- so so pretty! cuuuute! I've been digging the blue nails lately, I had them last week, now I need to find more colors! Love this nail look! That blue is GORGE! haha I know exactly what you mean! It's always so tempting to get an extra glitter nail polish at Sephora even if that's not what you went there for. I love that color!! What blues are your fave?